Mars - Educational facts and history of the planet Mars. Mars (Greek: Ares) is the god of War. The planet probably got this name due to its red color; Mars is sometimes referred to as the Red Planet. (An interesting side note: the Roman god Mars was a god of agriculture before becoming associated with the Greek Ares; those in favor of colonizing and terraforming Mars may prefer this symbolism.) The name of the month March derives from Mars. Mars has been known since prehistoric times. Of course, it has been extensively studied with ground-based observatories. But even very large telescopes find Mars a difficult target, it's just too small. It is still a favorite of science fiction writers as the most favorable place in the Solar System (other than Earth!) for human habitation. But the famous "canals" "seen" by Lowell and others were, unfortunately, just as imaginary as Barsoomian princesses. The first spacecraft to visit Mars was Mariner 4 in 1965. Several others followed including Mars 2, the first spacecraft to land on Mars and the two Viking landers in 1976. Ending a long 20 year hiatus, Mars Pathfinder landed successfully on Mars on 1997 July 4. In 2004 the Mars Expedition Rovers "Spirit" and "Opportunity" landed on Mars sending back geologic data and many pictures; they are still operating after more than three years on Mars. In 2008, Phoenix landed in the northern plains to search for water. Three Mars orbiters (Mars Reconnaissance Orbiter, Mars Odyssey, and Mars Express) are also currently in operation. Mars' orbit is significantly elliptical. One result of this is a temperature variation of about 30 C at the subsolar point between aphelion and perihelion. This has a major influence on Mars' climate. While the average temperature on Mars is about 218 K (-55 C, -67 F), Martian surface temperatures range widely from as little as 140 K (-133 C, -207 F) at the winter pole to almost 300 K (27 C, 80 F) on the day side during summer. Olympus Mons: the largest mountain in the Solar System rising 24 km (78,000 ft.) above the surrounding plain. Its base is more than 500 km in diameter and is rimmed by a cliff 6 km (20,000 ft) high. The southern hemisphere of Mars is predominantly ancient cratered highlands somewhat similar to the Moon. In contrast, most of the northern hemisphere consists of plains which are much younger, lower in elevation and have a much more complex history. An abrupt elevation change of several kilometers seems to occur at the boundary. The reasons for this global dichotomy and abrupt boundary are unknown (some speculate that they are due to a very large impact shortly after Mars' accretion). Mars Global Surveyor has produced a nice 3D map of Mars that clearly shows these features. The interior of Mars is known only by inference from data about the surface and the bulk statistics of the planet. The most likely scenario is a dense core about 1700 km in radius, a molten rocky mantle somewhat denser than the Earth's and a thin crust. Data from Mars Global Surveyor indicates that Mars' crust is about 80 km thick in the southern hemisphere but only about 35 km thick in the north. Mars' relatively low density compared to the other terrestrial planets indicates that its core probably contains a relatively large fraction of sulfur in addition to iron (iron and iron sulfide). Like Mercury and the Moon, Mars appears to lack active plate tectonics at present; there is no evidence of recent horizontal motion of the surface such as the folded mountains so common on Earth. With no lateral plate motion, hot-spots under the crust stay in a fixed position relative to the surface. This, along with the lower surface gravity, may account for the Tharis bulge and its enormous volcanoes. There is no evidence of current volcanic activity. However, data from Mars Global Surveyor indicates that Mars very likely did have tectonic activity sometime in the past. Early in its history, Mars was much more like Earth. As with Earth almost all of its carbon dioxide was used up to form carbonate rocks. But lacking the Earth's plate tectonics, Mars is unable to recycle any of this carbon dioxide back into its atmosphere and so cannot sustain a significant greenhouse effect. The surface of Mars is therefore much colder than the Earth would be at that distance from the Sun. Mars has a very thin atmosphere composed mostly of the tiny amount of remaining carbon dioxide (95.3%) plus nitrogen (2.7%), argon (1.6%) and traces of oxygen (0.15%) and water (0.03%). The average pressure on the surface of Mars is only about 7 millibars (less than 1% of Earth's), but it varies greatly with altitude from almost 9 millibars in the deepest basins to about 1 millibar at the top of Olympus Mons. But it is thick enough to support very strong winds and vast dust storms that on occasion engulf the entire planet for months. Mars' thin atmosphere produces a greenhouse effect but it is only enough to raise the surface temperature by 5 degrees (K); much less than what we see on Venus and Earth. Early telescopic observations revealed that Mars has permanent ice caps at both poles; they're visible even with a small telescope. We now know that they're composed of water ice and solid carbon dioxide ("dry ice"). The ice caps exhibit a layered structure with alternating layers of ice with varying concentrations of dark dust. In the northern summer the carbon dioxide completely sublimes, leaving a residual layer of water ice. ESA's Mars Express has shown that a similar layer of water ice exists below the southern cap as well. The mechanism responsible for the layering is unknown but may be due to climatic changes related to long-term changes in the inclination of Mars' equator to the plane of its orbit. There may also be water ice hidden below the surface at lower latitudes. The seasonal changes in the extent of the polar caps changes the global atmospheric pressure by about 25% (as measured at the Viking lander sites). Recent observations with the Hubble Space Telescope have revealed that the conditions during the Viking missions may not have been typical. Mars' atmosphere now seems to be both colder and dryer than measured by the Viking landers (more details from STScI). The Viking landers performed experiments to determine the existence of life on Mars. The results were somewhat ambiguous but most scientists now believe that they show no evidence for life on Mars (there is still some controversy, however). Optimists point out that only two tiny samples were measured and not from the most favorable locations. More experiments will be done by future missions to Mars. On 1996 Aug 6, David McKay et al announced what they thought might be evidence of ancient Martian microorganisms in the meteorite ALH84001. Though there is still some controversy, the majority of the scientific community has not accepted this conclusion. If there is or was life on Mars, we still haven't found it. Large, but not global, weak magnetic fields exist in various regions of Mars. 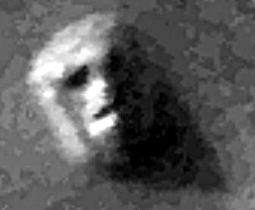 This unexpected finding was made by Mars Global Surveyor just days after it entered Mars orbit. They are probably remnants of an earlier global field that has since disappeared. This may have important implications for the structure of Mars' interior and for the past history of its atmosphere and hence for the possibility of ancient life. When it is in the night time sky, Mars is easily visible with the unaided eye. Mars is a difficult but rewarding target for an amateur telescope though only for the three or four months each martian year when it is closest to Earth. Its apparent size and brightness varies greatly according to its relative position to the Earth. There are several Web sites that show the current position of Mars (and the other planets) in the sky. More detailed and customized charts can be created with a planetarium program. ("Distance" is measured from the center of Mars). bacterial remains in the Nakhla meteorite? The original "MARS" by Percival Lowell, 1895. Mars Pathfinder, new images from the surface! Why are the northern and southern hemispheres of Mars so different? Why are the northern and southern polar caps different? What is the structure of Mars's interior? What is it composed of, and which parts are molten or solid? Is there still active volcanism on Mars? What exactly caused the erosion patterns that look so much like stream beds on Earth? How old are they? How much subterranean ("sub-martian"?) water is/was there on Mars? There's growing evidence, (eg, here: APOD) but it's not yet definitive; much more work is needed. Mars remains at the top of the list of possible life-bearing planets. The Viking probes found little evidence of life on Mars. But they sampled only two isolated locations. Is there life elsewhere or was there life at some time in the past on Mars? The recent meteoric evidence needs to be confirmed. Ultimately, a sample return mission will be necessary. The future of Mars exploration is more hopeful than for the other planets. Three orbiters and three landers are now in operation at Mars. Several more robotic missions are planned by NASA and others. But no one seems willing to put any real money toward a manned expedition.